RSVPs are the perfect extra for your guests, not only do they look beautiful alongside the invite but they encourage guests to reply straight away! Olive Weddings can apply any motif design to our RSVP and offers three different options, each is sized to suit your invite format. 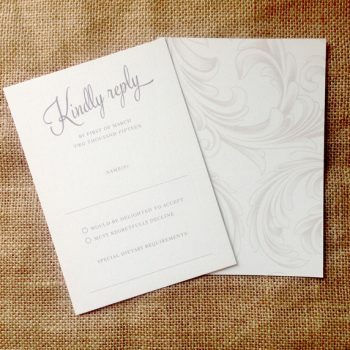 This is a simple card with your motif and a classic tick box for accepting or declining the invitations. We recommend a line to specify any special dietary requirements too. 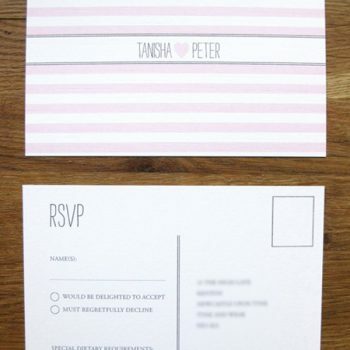 You may want to provide a printed or plain envelope for guests too. 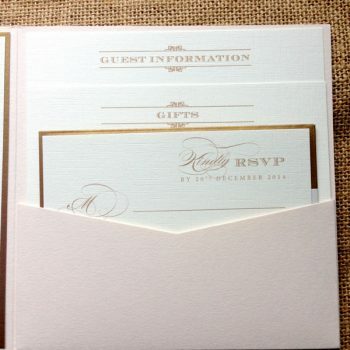 These have the same accept/decline on the front as the single sided option and either a pattern or include your menu choices which you need back with guests responses. You may also want to ask guests for accommodation choices or favourite songs or incorporate one of our complimentary patterns! Perhaps provide a printed or plain envelope for guests too. This is a lovely touch, has the usual motif and accept/decline boxes but is return addressed and has space for a stamp, no need for an envelope and you can even fit your response boxes on the front if you want to have menu options on the reverse.